As a fan of Disney movies, it often annoys me when the topic of Disney comes up (especially where it concerns princess movies) because the result is invariably people perpetuating the most cynical and pessimistic interpretations they can possibly imagine. Even more frustratingly, the criticisms levied against these movies often seem to be made by people who seem to haven't even seen the movies. Important note: What follows are merely my own opinions and connections I make based on my personal knowledge and research. I have no professional credentials on psychology except a high school degree in human sciences and sociology, so please do not under any circumstances take professional advice from me regarding very serious issues. I'm just here to defend a movie that I love. You are probably aware of this one. It's almost inevitable to come up in any discussion regarding Beauty and the Beast. "Beauty and the Beast was not a true love story! It was just Stockholm Syndrome!" So is this claim in any way valid? 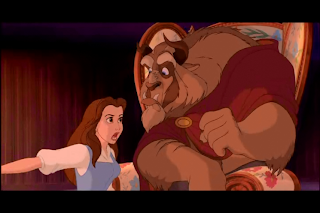 Is the love story between Belle and the Beast simply a severe case of her having Stockholm Syndrome? The oldest know version of this tale was published in 1740 as La Belle et la Bête rendered by Gabrielle-Suzanne Barbot de Villeneuve, the best commonly known version however was an abridged version written by Jeanne-Marie Leprince de Beaumont and published in 1756. From there sprang a lot of alternative versions. In these original incarnations, the tale of Beauty and the Beast contains a bit of propaganda for arranged marriages (or at the very least arranged companionship). A merchant picks a rose from a beautiful garden as a gift for his youngest daughter. The beast who owns the garden is prepared to kill the merchant for thievery but spares his life in exchange for said youngest daughter. She is understandably upset but after a while she grows to love the beast of her own accord, (sometimes) changing him back into a prince. 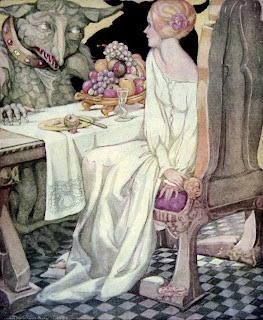 Anne Anderson's Illustration "Beauty and the Beast"
The original stories were of course a product of their time and in adapting them at least some of the original story elements must be translated to the screen or you simply aren't telling the same story. A key difference in the Disney version however is that, instead of the beauty's father handing over his daughter in exchange for his life, Belle willingly takes her father's place in the Beast's dungeon while her father begs her not to. This of course means that the (future) marriage is not arranged. This was likely decided to give more power to Belle and intentionally avert these unfortunate implications. 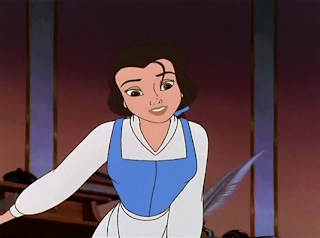 So, in having Belle as a prisoner instead, does it turn the situation into Stockholm Syndrome? Well a cornerstone of Stockholm Syndrome is the irrationality of the justifications a hostage makes for her captor and situation. The problem with applying this condition to Beauty and the Beast is that in order for it to work the movie should have basically stopped after Belle had first met the Beast with everything after that only happening in Belle's imagination. As if we were watching the movie through Belle's delusions, so to speak. Allow me to explain this. In order for Stockholm Syndrome to take hold, a captive must essentially come to fear outside situations and think interjection of rescuers (law enforcement) would only result in unnecessary violence and bloodshed. Furthermore victims will be overwhelmingly grateful for minor acts of benevolence, or merely the lack of any real abuse. The captor holds total control over whether his captive lives or dies. These conditions are enhanced by the captive only having the perspective of the captor available compounded by the intensity of the situation. So what happens in the movie? 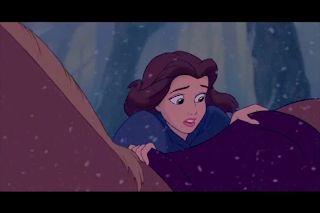 When she actually feels threatened by the Beast's violent outburst, she immediately flees the castle, meaning the only thing keeping her there in the first place was her promise rather than the Beast's physical control over her or her life. There were no bars preventing her from escaping on her own. During her escape she is attacked by wolves and she is subsequently saved by the Beast (perhaps you could question why he followed her). Her subsequent return to the castle was not through force, but to save the Beast's life who would have otherwise frozen to death (bled out?). That's not her mind jumping through curious loops, that's just her not being a vindictive sociopath. 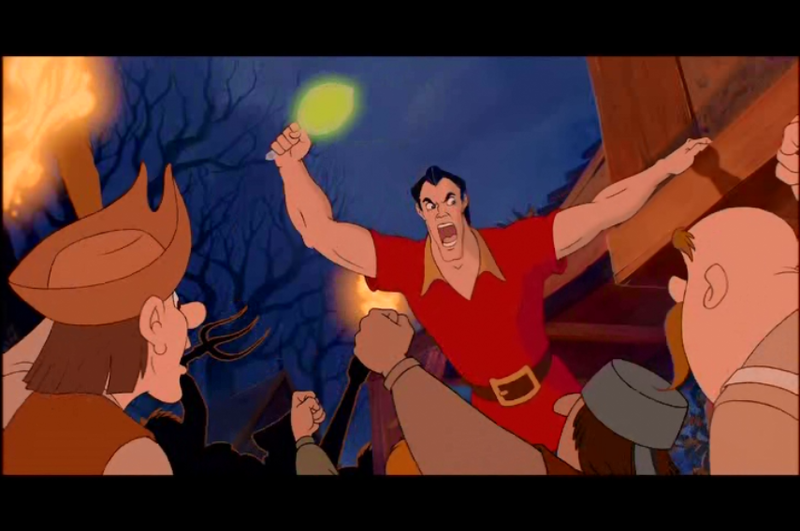 Later when Gaston learns of the Beast's existence he scares the villagers into brandishing their torches and pitchforks (and at this point she was not even anywhere near Beast's castle so you could say it was indeed a pretty big overreaction). 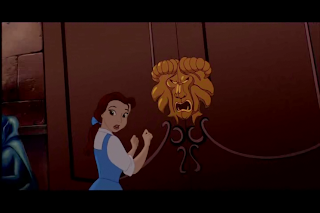 He also actually locks Belle up physically along with her father in their own cellar. When the Beast is being a jerk, Belle responds by either shouting him down or shutting him out completely. In the end Belle only warms up to him when there is a genuine effort on his part to become a better person ...or, beast. In this regard, the movie is a much better example of Lima Syndrome rather than Stockholm Syndrome. The Beast alters his personality for the benefit of his "hostage" while she essentially remains the same person throughout the movie. 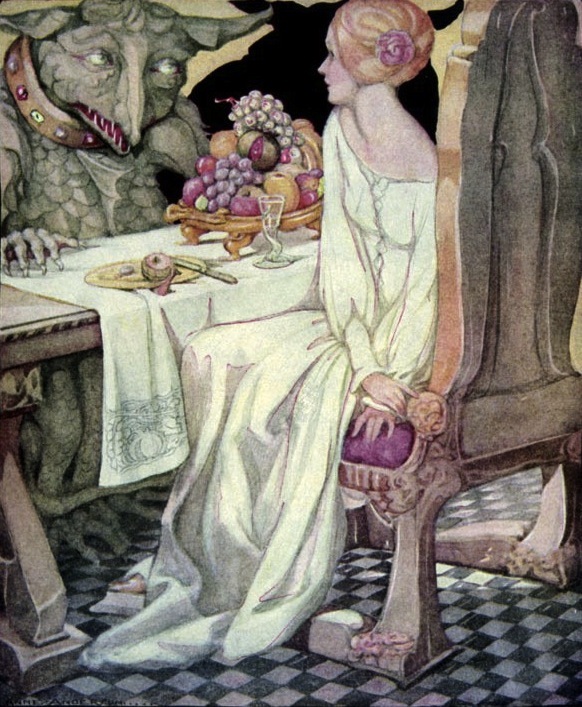 Furthermore Belle gets to talk to all sorts of other enchanted characters inhabiting Beast's castle, each with different opinions and viewpoints, thus negating her only having one perspective on her situation. Beauty and the Beast doesn't present us with Belle as making irrational justifications for mentally coping with her being in a dangerous situation, instead the movie presents us with a world in which otherwise irrational fears and justifications of Stockholm Syndrome are actually a complete reality regardless of how Belle reacts to it. The outside danger IS real. Outside involvement DOES result in unnecessary violence. The Beast IS ultimately benevolent towards her. So while the movie might be an interesting perspective in showing how a person suffering from Stockholm Syndrome perceives his or her current situation and environment, the condition itself does not apply to Belle unless the entire movie is a delusion existing only in Belle's mind. In other words, people likening the relationship between Belle and the Beast to Stockholm Syndrome are seemingly only aware of the very simplistic descriptions of the movie and the condition. 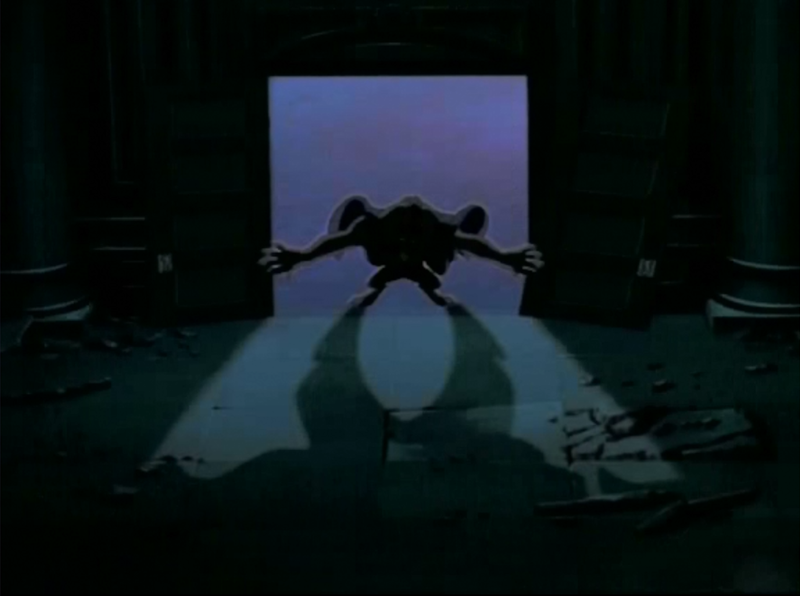 Also, if there's anyone in the movie who suffers from Stockholm Syndrome, it's Cogsworth in his total submission to the Beast even when his temper is out of control. The 1997 midquel "Beauty and the Beast: The Enchanted Christmas" however does pretty much turn the situation into Stockholm Syndrome, as it is entirely about Belle almost foolishly trying to make an increasingly violent Beast understand the spirit of Christmas. Whereas in the original movie Belle is being treated like a welcome guest rather than a prisoner after the wolf attack, the midquel (which takes place during the same time) puts extra emphasis on her being a prisoner trying to thaw out the Beasts temper. Which of course negates my points about the original movie (also the Beast can read in this movie, which contradicts a certain scene from the extended edition). Oh well, that's probably why certain Disney sequels carry such a bad name. I have not yet seen the 1998 midquel "Beauty and the Beast: Belle's Magical World" myself so I cannot discuss it here yet. 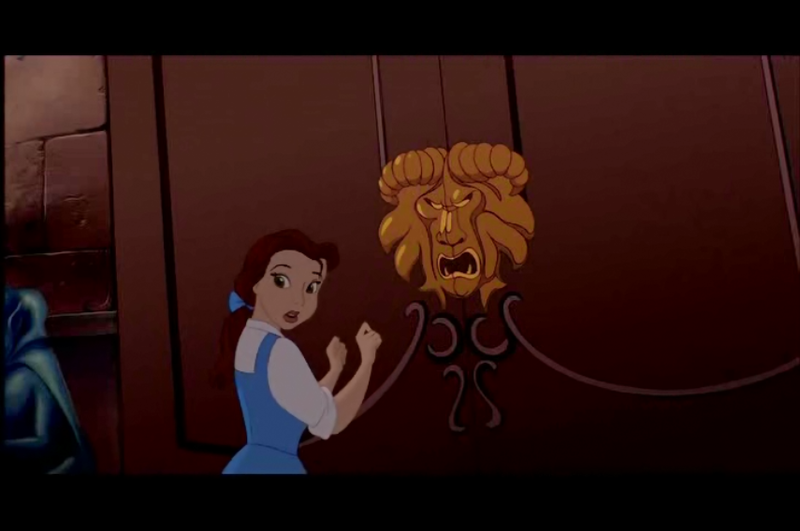 A certain Cracked article, which labels the relationship as Stockholm Syndrome, suggests that Beast giving Belle the library is an empty gesture as it was already there, and thus an example of a very minor act of benevolence (opening the door and pointing) that is overblown by Belle into the kindest thing ever. Clearly I interpret that scene differently. 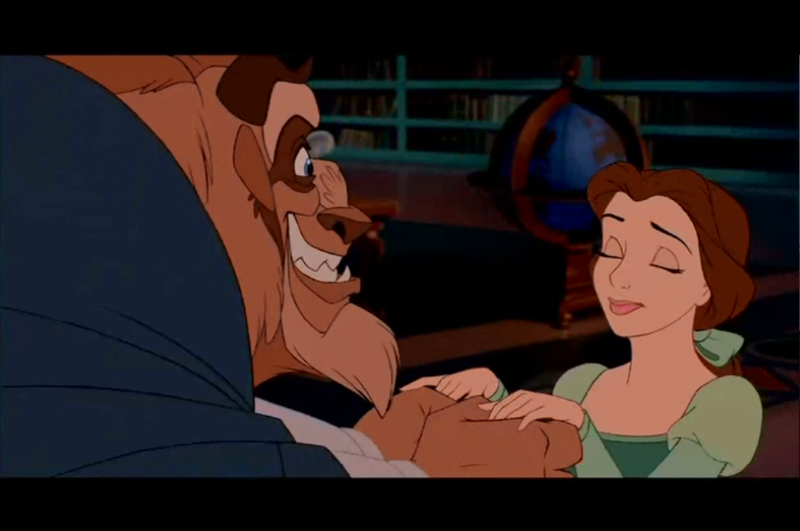 The Beast took the time to learn what Belle likes and bases his consideration for her present on that, even though he himself has little interest in books. 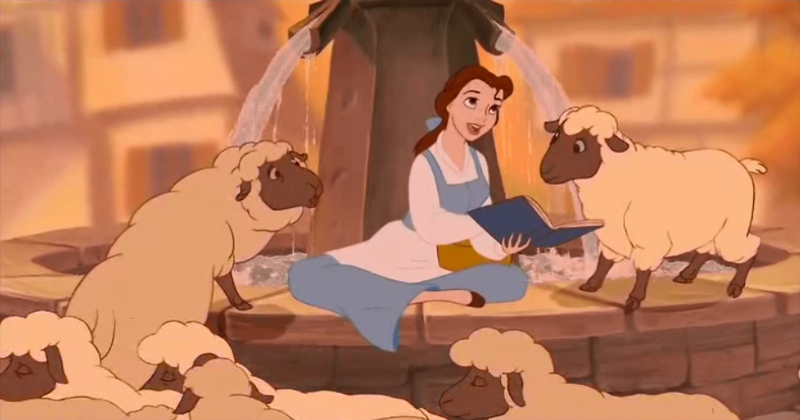 This even mirrors an earlier scene with Gaston in which he openly mocks Belle for reading books (soon she might even get ideas and *gasp* thinking!). This is further expanded upon in the extended 2002 DVD release, in which it is revealed the Beast can't actually read but attempts to anyway because of Belle. It is thus in no way an empty gesture for the Beast, after a lifetime of selfishness, to give Belle the library with childlike glee. Yes, the library was already there and as such he could have just opened the door and pointed, but the Beast learning the joy of giving and being considerate of another person's interests is the true power of this gesture. There's of course also the likely explanation that the article on Cracked is just taking the piss, as it tries to paint Gaston as a heroic figure. 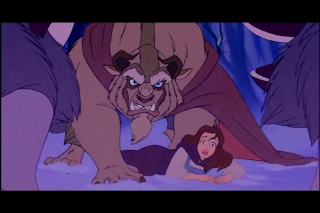 I think most people would consider the Beast's maturity reaches its zenith when he willingly releases Belle from the castle so she can save her father. However I'd argue that it is in fact his death scene in which he showcases a much more powerful gesture. In physically releasing Belle from the castle he had shown that he loved her so much that he would condemn himself to an eternal life as a Beast for her benefit. However in accepting his own death he had also set her free emotionally, for without the Beast there is absolutely nothing tying Belle to the castle anymore. 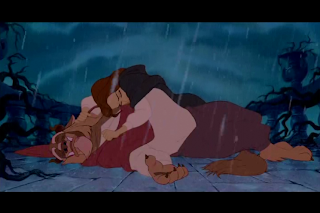 In essence, the Beast dying was the ultimate form of setting her free and I personally consider this a reason why the curse was broken at least as powerful as Belle realizing and saying she loved him. As for what it teaches your kids? I'm not cynical enough to read into movies the absolute worst message one can derive and then think every person or kid will take that message away from the movie. If the hidden message really was "stay with this abusive person because your kindness will change him", Belle could have just married Gaston instead and tried to change him. Looks weren't even an issue there because even Belle admits he is handsome. It's also not like throwing up "Stockholm Syndrome" as if it is something inherently bad is a good argument either. It is just a psychological mechanism built into the human brain, not some sort of toxic behaviour learned from a movie. Meanwhile the movie does show us that being kind and making an effort to improve your behaviour is a lot less destructive to you and your environment than being a violent, petulant child. The Beast learns this and is rewarded for it. Gaston doesn't and meets his end because of it. It seems to me that the message young girls would likely take away is much closer to "don't judge based merely on appearances" (even though the Beast is basically just a giant teddy bear instead of a hideous monster) rather than "your love will change this violent person" as is often said. It is important to note that staying in an abusive relationship is not necessarily the same as Stockholm Syndrome either. Stockholm Syndrome deals with hostage behaviour (and is often actually encouraged to happen by law enforcement to ensure the survival of hostages, even if it makes prosecution more difficult). A person staying in an abusive relationship is more accurately described as Battered Person Syndrome (often popularly gendered as Battered Wife Syndrome or Battered Woman Syndrome, even though there's no shortage on male victims). Actual instances of emotional abuse are actually portrayed in a couple of Disney movies, but you could hardly call them glorifying it. In both The Hunchback of Notre-Dame (1996) and Tangled / Rapunzel (2010), Quasimodo and Rapunzel are held captive by an abusive parental figure. They are not trapped with door locks or prison cells, in fact both movies make it very clear they could have easily left at any moment if they really wanted to do so. Instead they are emotionally trapped by a parental figure they see as kind and benevolent even though we as the audience see them for the villains they really are. Frollo and Mother Gothel prey on Quasimodo's and Rapunzel's insecurities, making them think the outside world would chew them up if they ever left their sanctuaries. So Disney does have characters who are in toxic relationships with each other (although parental rather than romantic) and appropriately they are shown in a clear negative light. 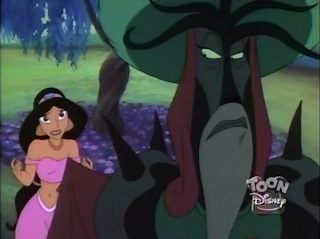 Interestingly, there's actually an episode of the Aladdin TV Series called "Garden of Evil" which follows a remarkably similar premise to the original story of Beauty and the Beast. In it, a much younger Sultan picks a flower from a mysterious garden only to be confronted by its keeper. In exchange for his life the Sultan offers Arbutus, the keeper of the garden, the most precious treasure in Agrabah, which Arbutus will collect in 20 years. Obviously, Sultan cares much more about his daughter than he does any of his treasures, so when the time comes Arbutus takes her instead. 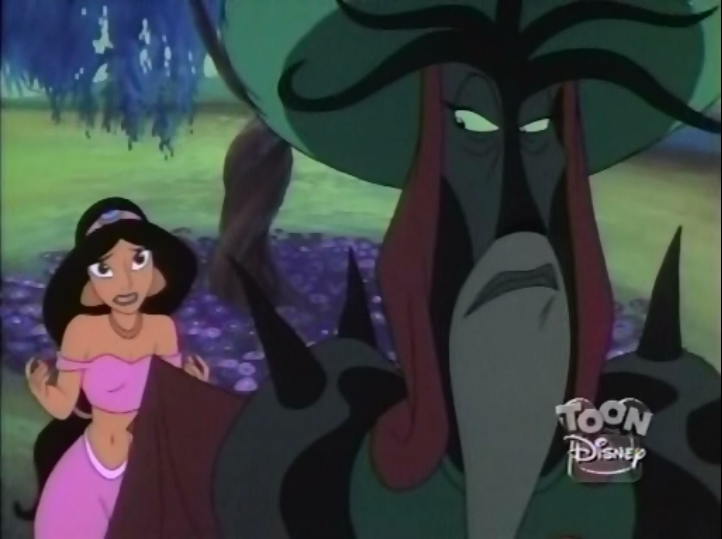 There's obviously no love story here considering Jasmine is already engaged to Aladdin and since this is just one episode in a TV series there isn't that much in-depth characterization, but by the end Arbutus is shown in a much more sympathetic light and Jasmine does end up defending him against Aladdin, who only sees him as another monster of the week who has to be defeated. In the end it provides the moral that we should come together over our similarities rather than demonize each other over our differences. Having a bit of understanding for each other isn't a bad thing after all. For another interesting twist on the Beauty and the Beast story (although having nothing to do with Disney) you could check out Andrzey Sapkowski's The Last Wish, a collection of short stories featuring twisted versions of classic fairy tales set in the world of The Witcher where the second story in the collection turns the tale of Beauty and the Beast on its head. I think there's a clear overreaction by the moral guardians who read too much negativity into Disney movies. In adapting old stories which may contain potentially offensive messages to our modern sensibilities, Disney puts in a lot of effort to maintain the charm of the story while also clearly altering certain aspects for the modern era (another example: Ariel from The Little Mermaid already had a complete obsession with the human world long before she ever saw Prince Eric, but that's a topic for another time). This generally gets overlooked by people complaining about these movies and as a fan, this cynical view sort of saddens me. From my perspective, Disney's Beauty and the Beast is an absolutely beautiful and heartwarming movie and I see no value in reducing its impact. I thought it was obvious that anything "Heroic" about Gaston was actually envy/lust from pretty much the whole town. It's sort of hilarious how the entire town is basically a textbook example of mass hysteria and groupthink gone horribly wrong yet nobody seems to have caught that particular message. And don't forget LeFou- poor guy WAS beaten and threatened by the guy, but he really didn't have anything going for him OTHER then Gaston!!! "And when I am dead I'll be deeeeecompoooosing"
I think I had more. XD I sing it every time I see Gaston die. Hey, thanks for this article. It seems too many people today think so much about the general idea they forget the details are everything. Yes, she's technically a captive, that doesn't make it a case of Stockholme!